The fridge is full of energy drinks. Heads hover motionless, inches from illuminated screens. An arcade machine sits tucked in a corner. Gorgeous concept art, in various stages of completions, drapes itself on all four walls. Sanzaru feels like a place where video games are being made. This is the language that gamers and developers share. But pride of place, on a single large scale wall, in clear view of the entire studio, is the centre piece - a collection of letters. Hand-written, hand drawn - magnetised onto the space like finger paintings. Placed front and center so everyone can see. "First off I am so grateful that you took up the challenge to make Sly 4." That one's from Maddie, aged 13. "Ever since I beat Sly 3 I wanted a Sly 4 and that's been almost two years now… but with Sucker Punch working on Infamous so much, there was no telling how long it would be until the next Sly game. When the Sly collection came out with the teaser trailer I was jumping for joy. And then E3 this year got me really excited so thank you so much. ☺"
With fans like Maddie cheering on Sanzaru, pushing them to make sure Sly Cooper: Thieves in Time lives up to the Sly legacy, how could they fail? After putting in a stellar shift with The Sly Collection, a HD upgrade of the first three Sly Cooper games on PS3, Sanzaru were given the keys to the kingdom - a shot at creating the next entry into the Sly Cooper franchise. 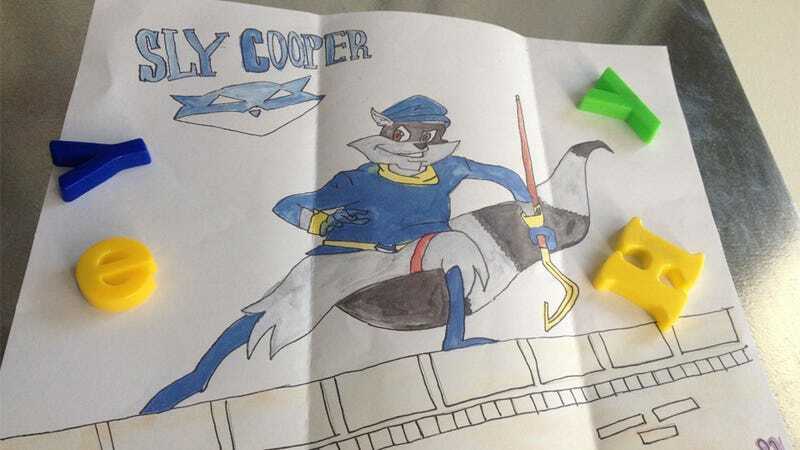 It's letters like Maddie's - from fans who adore the series - that constantly remind the team of their responsibility to those who love Sly Cooper. "Sly Cooper fans are all super excited about the game and, when they send in pictures and stuff, all that does is make me want to work harder," says Caley Roberts, Producer. "Because there are times when you're sitting in this cube for 20 hours and you're like, ‘I just want to get this level done, and you stop caring as much because you're tired and you're supposed to already be finished. "Then you look over and you realise that the stuff you're working on translates directly into joy for kids. And damn, that feels really good." It's a sentiment that feeds directly from the top down. Sanzaru Predident Glen Egen receives the fan mail. It was his decision to post it on the wall for all to see, as a reminder of precisely how high the stakes are. Sanzaru is working on a franchise people are heavily invested in, and Glen wants the entire team to be aware of that fact. "It's so inspirational to see how people just connect with the characters," says Glen. "Just having a sense of that greater collective experience is sort of core to our work. That's something we've really bought into." Matt Kraemer, Lead Designer on Sly, agrees. "It's motivating, because you're working on the game and then you get stuff in the mail, and I'm like, ‘the team should see that stuff', because everyday you're sitting and your desk working on something - in the future fans are going to be writing fan mail about that stuff." "Remember that one visitor," begins Matt. "The one who came to the front door?" One cold San Francisco morning, the front bell rings. On the other side of Sanzaru's glass entrance stood a determined 12 year-old boy, flanked by a supportive, but seemingly bemused mother. His objective was simple - he wanted to check up on the progress of the new Sly Cooper game. He wanted to make sure the folks at Sanzaru were on the right track. "He came in with his mum," laughs Glen. "He was about 12 years old. "He just said, ‘I wanted to make sure everything was okay, and you guys were taking care of the game. Are you taking care of it? I'm just making sure, because it's really important to me!'" The team at Sanzaru Games want to satisfy established fans, but Sly Cooper must also have the capacity to bring back fans of the original games, and reach out to new fans in that age bracket. Unashamedly, Sanzaru is shooting for a broad audience. "That variety allows lots of different age groups to get engaged. The writing is quite layered." "There's stuff for the younger audience," he says. "And then there's stuff for the parents who are sitting behind." "Yeah, like all the references that only parents will get," continues Glen, finishing Matt's sentence. "All that kind of stuff is just layered in there to give the game that broader feel." It makes perfect sense, studios in Hollywood have been pulling off this magic trick for decades - attracting a younger audience with the high concept, then seducing the parents with extra layers of quality, via the minutiae of detail and sneaky asides. If Pixar and Disney can do it, why not Sanzaru? Why not Sly? "I wish more games would try it," says Glen. "I don't think the desire to appeal to both sets of audiences changes any design decisions, but we both have kids and we want them to able to sit and enjoy it with us. We just have to make sure we have a lot of variety. "The one thing with Sly is it there are so many different types of gameplay in the games: you've got big boss battles, you have the stealth, you have driving sections you've got mini games, you have puzzles, you have upgrades… there's just so much to the game, and that appeals to the broad audience." In the early 2000s the market was teeming with games like Sly Cooper: Thieves in Time - games that skirted the line between demographics. High quality platforming experiences, games with accessible fun platforming mechanics; video games that refused to take themselves seriously. Fast forward a decade, in a world where the po-faced shooter is King, a game like Sly Cooper is an anomaly. Sanzaru is aware of the challege. "It's just breaking through to those people, that's the important part," says Matt. "We do focus testing, we get guys that would normally be interested in Modern Warfare. They sit down and play, and then they're like, ‘dude… that was great. I would never have bought this game but when it comes out I'm going to buy it." I ask Matt if that worries the team, the fact that adult focus testers are delivering the line, ‘I would never have bought this game, but…'. "Yeah," he admits, "they just have that perception that it's a kid's game." ‘A kid's game' - there's absolutely nothing wrong with that. Toy Story, technically, is a kid's movie. Harry Potter is, technically, a children's book. People who play video games have children and - a decade on - those who grew up playing Sly Cooper on the PS2 have children. Given these circumstances, there little reason to doubt that a game like Sly Cooper: Thieves in Time can't bridge the gap. To date, Sanzaru hasn't received any hand written fan mail from adults, most of it comes from kids in the 7-13 age bracket. But that may change with the release of Sly Cooper: Thieves in Time.